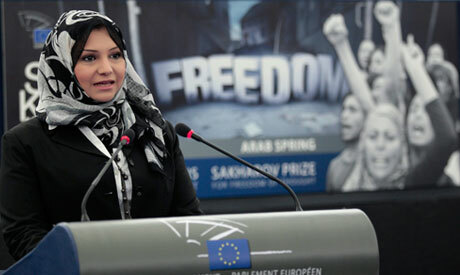 The European Parliament honoured five Arab Spring activists with its Sakharov human rights prize Wednesday, including the Tunisian who sparked region-wide uprisings by setting himself on fire. Just two of the winners, who share a 50,000 euro ($70,000) prize, were in the parliament for the presentation ceremony. Tunisian fruitseller Mohamed Bouazizi won the award posthumously for freedom of thought, while a Syrian pair, lawyer Razan Zeitouneh and cartoonist Ali Farzat, were prevented from attending "for obvious reasons", according to EU foreign affairs chief Catherine Ashton on Tuesday. The other winners were Egypt's Asmaa Mahfouz and Libyan dissident Ahmed al-Zubair Ahmed al-Sanusi. During the ceremony Buzek hailed "five courageous women and men who represent the Arab Spring," on the day Time magazine named simply 'the Protester' as its person of the year. Bouazizi, an unemployed university graduate, set himself on fire on December 17 to protest abuses under the 23-year Tunisian regime of Zine el Abidine Ben Ali. He died two weeks later. Egypt's Mahfouz helped organise strikes and protests against Hosni Mubarak's regime. Libyan dissident Sanusi, 77, spent 31 years in prison after trying to organise a coup against late leader Moamer Kadhafi and is now working with the country's new rulers. Zeitouneh, a 34-year-old lawyer, created a blog to document atrocities committed by Syrian President Bashar al-Assad's regime during its relentless crackdown on pro-democracy campaigners. Farzat is a political satirist whose cartoons have helped fuel the pro-democracy revolts. In August, Syrian regime security forces brutally beat him, breaking both his hands. Past winners of the prize named after Soviet-era physicist and political dissident Andrei Sakharov include anti-apartheid icon Nelson Mandela and former UN chief Kofi Annan.